Oral in nature, traditional culture was transmitted via observation and practice day-in day-out. This is encompassed in the ‘Learning from the root’ experiential programme where youth is integrated into a host family to experience culture by living it. MARK MWANGI writes. The Youth, Culture and Biodiversity (YCB) thematic area of ABN aims to deepen peoples’ sense of belonging, with one another and with the earth, in order to restore confidence eroded over years of marginalisation of indigenous ecological knowledge and practices. Strategies used to achieve this include bridging the gap in knowledge between elders and the youth on indigenous ecological knowledge, and lobbying for inclusion of this knowledge in school curricula. In the past three years, the work has grown in its effectiveness and complexity and has been refined enough to be used in a wider context. Children and youth are now taken to experience nature and culture and connect with themselves and engage through a range of proactive endeavours in both their schools and communities. In Ethiopia and South Africa, respective government offices are consulting ABN partners to advise on how to integrate traditional ecological knowledge in to the school system. Celebrations are happening in partner countries involving local communities and decision makers and building both the confidence and the identity of the community, which are some of the basis for resilience building. Youth are actively involved in healing ecosystems and in campaigning when degradation happens due to various forces. In Ethiopia, youth who come out of this process are demonstrating credible leadership in critical positions in various government institutions and universities as their confidence is built and their relationship with the earth strengthened. One such event happened recently ((October 2015, spearheaded by the Institute for Sustainable Development (ISD)) whereby participants drawn from across ABN’s members and partners visited Konso Gamole village in southern Ethiopia on an experiential learning four-day cultural exchange visit. The exchange visit involved participants integrating into an assigned host-family for deeper learning through observation, dialogue and active participation in daily family and/or communal chores. The choice of Konso Gamole village was deliberate as the village is unique in that it has managed to preserve its cultural identity over the years and has been awarded recognition as a UNESCO World Heritage Site. Among its exceptional identity include its stone walls, generation trees and agro-ecological practices such as building terraces to control soil erosion, thus preserving soil fertility, and nurturing indigenous seeds. Keeping local variety seeds: Indigenous seeds are well preserved using local knowledge. Agro-forestry practices: Terraces are quite effective at controlling soil erosion. The rocks used for the terraces are from the reclaimed rocky farmlands. 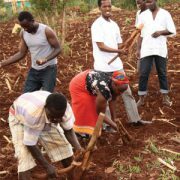 Communal labour: Farms prepared in minutes, hence effective use of time and labour. Role of elders: Elders are mediators in conflict as well as custodians of indigenous knowledge. Intergenerational knowledge transfer: Quite effective though modern education poses a threat to the process.